“No es posible” (that is not possible) is one of those generic phrases that everybody who spends any amount of time in Cuba learns to take in stride. In fact the answer to many questions often begins with “no es posible” but the experienced Cuba hand quickly learns that the objective is to maintain the dialog long enough to arrive at the word “Pero…” (but…). If you are dealing with familiar persons, then “pero…” arrives quickly, often in the same sentence as in “no es posible” to take the local bus, pero most drivers will not say anything if you just walk on and drop your money in the box. When dealing with strangers however, there is a ritual verbal dance which must be performed that in some cases can last quite a long time. For example if one inquires where they can buy some of the excellent local bulk rum (bring your own jug), you might hear “no es posible” because you must have a ration book which is only for the Cuban people. If an overpowering desire to buy a 1.5 liter pop bottle of silky smooth rum for $1, causes you challenge the response by saying something like, we have friends who bought it last week and it was very good, the conversation will likely come to an abrupt end. If however you say something like, ”yes it is difficult for everybody these days” accompanied by an appropriate sigh, you might get to “pero” or you might get another reason why it’s “no es posible” requiring another tangential non sequitur with the requisite sighs to keep the conversation flowing. Only when you demonstrate that you are sympathetic and more importantly safe to talk to will you get to “pero” I have a cousin who doesn’t drink but would be willing to part with his rum ration. If a cruiser were to accept “no es posible” as gospel every time they heard it, they will never leave their boat and eventually they will leave the country completely frustrated, having missed much of what the country has to offer. And so it was armed with this deep knowledge of Cuban culture that Pat and I became acquainted with the harbourmaster in Casilda, a small fishing village next to the UNESCO heritage site of Trinidad in Sancti Spiritus Province. It was shortly after 7:00PM and I was feeling pretty mellow after having downed a very large rum on the rocks in the cockpit of Threepenny Opera as she swung gently at anchor in Casilda harbour. Pat and I had arrived about 2 hours earlier after an extremely rough passage running down the coast from Cienfuegos in 6+ seas ahead of a tropical system. On several occasions I had considered turning around, but since we had already spent 10 days in Cienfuegos, we were itching to see something new. Furthermore the swells at the entrance to Cienfuegos would have been in the 10 foot range and bashing into them didn’t seem like a lot of fun, even though the worst would have only lasted about 15 minutes. The warmth of the rum and the gentle rocking of the boat was lulling me to sleep when a deep voice reminiscent of Lorne Greene came over the VHF calling for the “moto valero” (motor sailer) in Casilda Harbour. Since Pat and I usually travel alone, and we run our engine often while traveling, we have come to recognize that a call to a “moto valero” usually meant it was for us. Dutifully I grabbed the cockpit mike and responded with my best “Buenos Tardes El Capitan eso es La Valero Threepenny Opera” and as I said it, I could hear the Homer Simpson voice in my head say ”Doh! !” as I realized the purpose of the call. There is loose rule in Cuba that when there is a marina in the area a cruising boat is expected to use the marina rather than anchor in the open. Our 1999 cruising guide did not have many good things to say about the local Marina Cayo Blanco so we had made a conscious decision to avoid it and drop the hook near where the local fishermen anchored. As it turned out that was a bad decision on two counts, firstly the local authorities are sticklers for the rules (mentioned in the guide) and secondly we were too close to an unguarded shore where anybody could have swum out and climbed aboard. I was just about to smack my forehead with the palm of my hand when I heard the dreaded “no es posible” through the speaker informing me that anchoring was forbidden. We were not in a good situation. It was about 20 minutes before sundown, we were in an unfamiliar and very shallow harbour with charts that did not show the channel to the marina and the captain was half asleep in a rum induced fog. We’ve all heard the expression “it was the alcohol talking”, but in this case the alcohol was not talking but rather yelling a belligerent “no es posible ir” (it is not possible to go) There were no non sequiturs uttered, no sympathetic sighs, just a ham fisted and likely grammatically incorrect invitation to face off! I will never know if a more diplomatic approach could have changed the outcome but after 5 minutes of partisan “no es posibling” in increasingly louder tones, a hazy memory of uniformed soldiers holding billy clubs swam into my consciousness. I don’t know if Lorne Greene could have called in the cavalry but suddenly the rum fog lifted and instead of continuing to yell, I acquiesced with OK OK OK we’re [expletive deleted] moving. I’m not sure how much English the harbour master spoke, but it was either the OK or the VHF license revoking words that brought silence to the airwaves. Pat could tell that I was more than a little perturbed as she handed me my PFD in preparation for engine start. By the time the engine was started and our anchor had been pulled it was about 10 minutes before sunset and the marina was at least 20 minutes away. As I pulled back into the main shipping channel, I ran the throttle as high as I dared to cover as much distance as possible in the failing light to get to the approach into the marina before it became too dark to see. As the sun dipped below the horizon I edged Threepenny Opera out of the main channel and pointed towards a marker about a mile away on the other side of a now invisible shoal of mud and sand. Earlier I had seen a catamaran exit the marina on approximately the same track so in the absence of any other information I attempted to create a reciprocal path. Pat was maintaining a bow watch as the twilight deepened around us. By now the marker was only about ¼ mile ahead of us and we were gliding slowly with about 1 foot of water under our keel. Suddenly Pat pointed to port of the bow, and then she pointed to starboard and started yelling Stop! Stop! Stop! Instead of stopping, I found myself stepping away from the wheel to see what she was pointing at when Threepenny Opera, like an obedient pet stopped all by herself as the engine rattled and stalled. By the faint glow of sunset in the west and the light of a rising full moon, I saw the line of floats streaming away on either side of the boat. I had run into fish net and we were caught like a fly in a spider’s web. It was too dark to go into the water and after several attempts at using our Spurrs line cutters to free ourselves it became obvious that we were not going anywhere. My greatest concern was that our transom pointed towards the prevailing wind which meant that a squall during the night could easily flood our cockpit and possibly drive water down the companionway into the salon below. Fortunately sinking was not a concern as we were almost sitting on the bottom anyway. I was growing agitated as I contemplated going into the dark, and possibly crocodile infested water with a flashlight and a knife. Pat and I were discussing our options when I heard a small knocking on our hull. I looked up to see an old man and a teenaged boy, possibly his grandson standing in a small wooden rowboat. The old man was pushing down on the top of the net with his oar while the young boy reached into the water and used a rusty knife to saw away at the net. I stood and watched in stunned silence as I shone my flashlight into the water so the young man could see where he was cutting. After about 10 minutes of cutting, the old man retrieved his oar and made a shooing motion with his hands as Threepenny Opera began to swing into the breeze. The next morning in dead calm conditions I went over the side and in short order I managed to cut about 20 pounds of fishing net free from our prop. With the remnants of the net piled on our swim step we pulled the hook and motored the short distance into the marina anchorage where we were to remain for the next 7 days as torrential rain from Tropical Storm Alberto drenched the area and caused widespread flooding. In a country where “no es possible” is the order of the day it is the simple things that stand out. Two strangers who came out of the night to offer assistance without exchanging a single word and then gliding into the night when their efforts were successful is just not something that happens in more “civilized” parts of the world. I have never figured out who they were, but their act of kindness will always be remembered. And it is because of this and other simple acts of kindness in the face of “no es possible” that Cuba will always have a special place in our hearts. After our week of drenching in Trinidad, we headed off for the Jardin de la Reina. The adventure contines. Let us know you are out there by joining our site. Click on the Join link under our profile on the right side of the screen. Enjoy the Pics! Threepenny Opera is a 1999 Catalina 42 MKII. Click on her pic to see some of the mods we've made for long term blue water cruising. 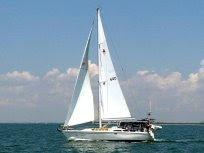 We are all about comfort, safety and ease of sailing. For those of you who are waiting to get your boat ready before casting off, we have been on board full time since June of 2008 and the mod's are continuing. She's Pat, He's Addison. In case you were wondering.... We went to see the Threepenny Opera on our first date back in 1976. So we are both of the mind that sailing off into the sunset is sort of a new beginning.... Hope the next 30 years are as good as the last 30 years!! CFN5137@sailmail.com - most reliable we will get messages within 24 hours, as we pick them up via SSB radio. NO ATTACHMENTS! The service will strip them off to save space.